In this game tutorial we’ll focus on creating the formulas we need, to learn more about formulas in general read this how-to. For everything related to physical attacks (using ATK and DEF). For everything related to magical attacks (using MATK and MDEF). For the different chance calculations (like hit or counter chance). For other things (like the turn order calculation). Formula types are created in – you should already know – the ORK Framework editor. So open the editor and navigate to Game > Formula Types. We need four formula types, so add the needed number and change the following settings. That’s it for the formula types. Now let’s create our formulas. Keep in mind that the formulas are a crucial part of how your system works and how balanced it will be. Since you can simply use another formula within a formula as a calculation step, we will break down some of the formulas to basic blocks, so that we later only have to tweak and balance a small number of formulas. To calculate the turn order in battles (turn based, active time). Calculates a factor based on user and target level (same level > factor 1). Calculates a chance if an attack will hit the target. A LUK based chance, used for counter, critical and block chance. The base physical damage calculation. 5 times the base physical damage. The base magical damage calculation. 5 times the base magical damage. 10 times the base magical damage. Calculates the HP refresh of a light heal ability. 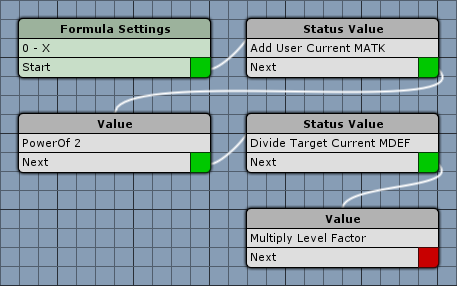 That’s 10 formulas in total, so navigate to Game > Formulas and add the needed number of formulas. Formulas are created using a node editor – you can learn more about the node editor in this how-to. We start with a simple formula to calculate the order of turns in battle. The minimum value of the formula should be 1. In Turn Based battles, the formula is calculated at the start of a turn for each combatant – the combatant with the highest result will have the first move, followed be the next highest combatant, and so forth. In Active Time battles, the formula is used to fill each combatants timebar over time (i.e. the timebar will be increased by the formula’s result). 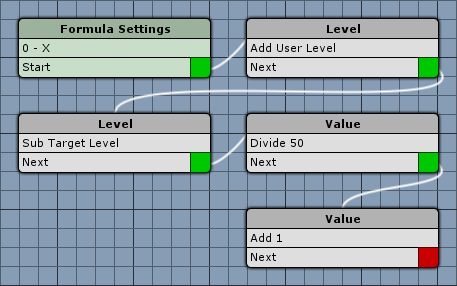 To create the formula, we need four additional steps (nodes) beside the start node. Add another status value step on this node’s Next slot. 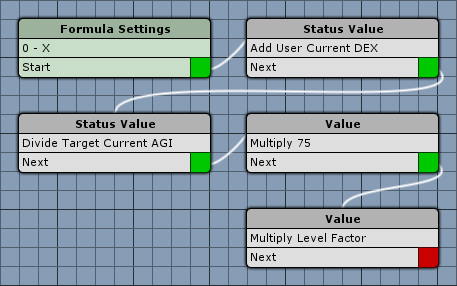 Now, add another status value step on this node’s Next slot. That’s it for this formula. The level factor will later be used in other formulas to influence their outcome. Basically it’s used to give higher level combatants an advantage when fighting lower level combatants. If the combatant’s have the same level, the factor will be 1. The minimum value of the formula should be 0. The value 50 in the formula is related to level 99 being the highest level in our game – it’s not really half of it, but it gives us a nice increase of 10 % every 5 level difference (i.e. if the attacker is 5 levels above it’s target, he will do 10 % more damage). Add another level step on this step’s Next slot. Add another value step on this node’s Next slot. Our hit chance is based on the relation between the user’s DEX and the target’s AGI – if they’re equal, the hit chance should be 75 %, but we also use the level factor we just created to give higher level combatants an advantage. This formula’s minimum value is also 0. Add another status value step on this step’s Next slot. Select Level Factor (the formula we just created). This formula is similar to the hit chance, but is used for all LUK based chances (counter attacks, critical hit, blocking attacks). The chance is based on the relation between user and target LUK, the chance is 5 % if both are equal. This formula’s minimum value is also 0. Again, we need four additional steps (nodes). 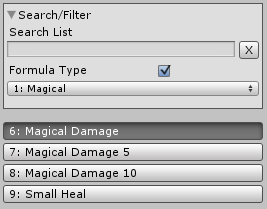 Now we’ll create the base physical damage calculation. The physical damage is based on the user’s ATK and the target’s DEF – and we’ll also use the level factor formula. To get thing’s a little bit more complex, we’ll use a power of calculation to increase the attack with higher ATK values. The minimum result should be 0. And again – four additional nodes needed. This will be easy, simply use the physical damage formula and multiply it by 5. A minimum value isn’t needed, since we only multiply another formula with a minimum value of 0. We only need one additional step this time, because we can use the other formula as start value in the formula settings. Change to Physical Damage 5. The base magical damage calculation is similar to the base physical damage – only we’ll be using the user’s MATK and the target’s MDEF. The minimum result should be 0. Like Physical Damage 5, this formula multiplies the magical damage by 5. Change to Magical Damage 5. Same thing, only times 10. Change to Magical Damage 10. Our final formula will calculate the amount of HP a small heal ability will refresh. It’s based on the user’s MATK and ignore’s the target’s status. Again, minimum value of 0. We need two steps this time. That’s it for the formulas – click on Save Settings. Now that all our formulas are completed, you can try filtering the formula list using the Search/Filter box above the list. It’s a lot easier to find a certain formula this way, since we separated the formulas into the different types. And that’s it for now – the next lesson will cover Abilities.